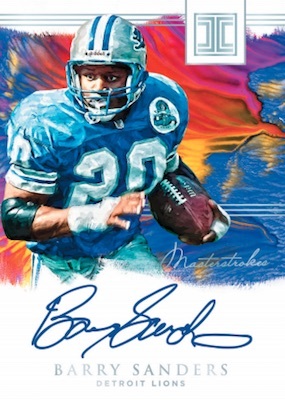 One of the first high-end offerings of the season to showcase rookies in their NFL gear, 2018 Panini Impeccable Football is heavy on autographs, including many hard-signed options. Every Hobby box should contain five signatures with at least one being a rookie patch autograph. This matches the 2017 edition. There are also case-hit gold and silver piece cards. With five autographs per eight-card box, that leaves three spots for the premium base set. We are still waiting on full details here but low-numbered parallels are expected. 2018 Panini Impeccable Football also brings real gold and silver into the mix. 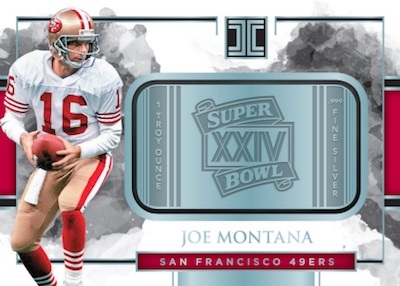 Combining to fall one per case, collectors can find Silver Super Bowl (#/15 or less) or Gold NFL Shield (1/1) cards. Additional options include Silver 49ers and Silver Broncos. The silver cards feature one troy ounce of .999 fine silver while the gold cards present 1/2 troy ounce of 14K gold. Although those are impressive cards, the 2018 Panini Impeccable Football checklist really makes its mark with the many autograph choices. The Elegance line leads the way with Elegance Rookie Helmet and Patch Autographs, numbered to 75. These add Helmet/Nameplate (#/25), Helmet/Glove (#/15) and Dual NFL Logo (1/1) editions. There are also more basic Rookie Autographs (#/75) utilizing a sticker signature. Parallels include Red (#/49), Silver (#/25), Gold (#/10), Emerald (#/5), Platinum (1/1), and Printing Plates (1/10. 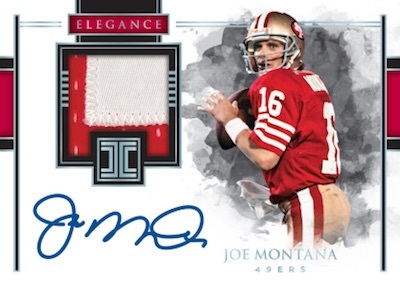 Elegance is home to past and present greats, as well, with hard-signed Elegance Veteran Patch Autographs and Elegance Retired Patch Autographs. Numbered to 75 or less, more rarity is present in the Silver (#/25 or less), Gold (#/10 or less) and Platinum (1/1) parallels. Yet another auto relic is found via the on-card Extravagance Patch Autographs (#/49 or less) insert. In addition to the full assortment of parallels noted above, the memorabilia cards include one-of-one Printing Plates. Those with an appreciation for artistic designs may enjoy Masterstrokes. The colorful insert is numbered to no higher than 99 copies per card. Finally, we come to the multi-signed cards, including Inkpeccable Duals (#/25 or less), Inkpeccable Trios (#/15 or less) and Inkpeccable Quads (#/10 or less). 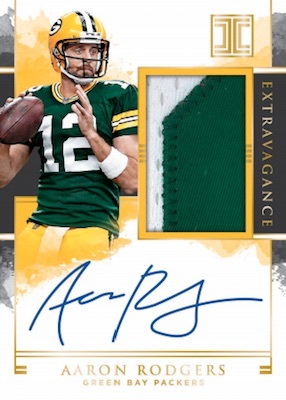 2018 Panini Impeccable Aaron Rodgers Worn Patch ON CARD Auto #10 10! Ebay 1 1! Randy Moss 2017 Panini Impeccable Stats On-Card Platinum Auto 2 23! Patriots! Shop 2018 Impeccable NFL cards on eBay. PARALLEL CARDS: Silver #/25, Gold #/10, Emerald #/5, Platinum 1/1, Printing Plates 1/1. PARALLEL CARDS: Helmet/Nameplate #/25, Helmet/Glove #/15, NFL Logo 1/1. PARALLEL CARDS: Red #/49, Silver #/25, Gold #/10, Emerald #/5, Platinum 1/1, Printing Plates 1/1. *Troy Fumagalli not in base; Tanner Lee only in Platinum parallel; Auden Tate only in Emerald/Platinum/Plates parallels. 16 Silver and 18 Gold parallel cards. 25 Silver and 29 Gold parallel cards. 11 Silver and 11 Gold parallel cards. 15 cards. Serial numbered 1/1. 9 Silver and 26 Gold parallel cards. 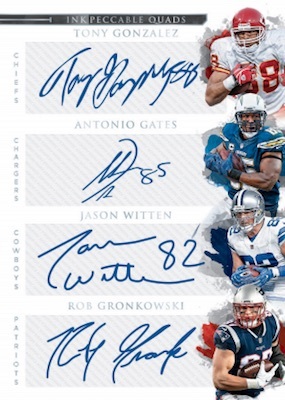 PARALLEL CARDS: Printing Plates 1/1 (No Tom Brady*). PARALLEL CARDS: Platinum 1/1, Printing Plates 1/1. 31 Silver and 39 Gold parallel cards. PARALLEL CARDS: Silver #/25 or #/10 (No Tate*), Gold #/10 or #/5, Platinum 1/1, Printing Plates 1/1. 100 cards. Serial numbered #/15. View the full 2018 Panini Impeccable Football checklist spreadsheet. I am sure the cards will look awesome and there is an okay variety in the checklist. However, the greatest quantity of autos for the Cowboys is Bob Lilly? He is a Cowboys great, but perhaps mix it up. Another Bo Scarbrough in a Panini product. He is in every set this year and didn’t make the team. Don’t expect that in an upper tier product. Enjoyed this product last year and the year before. Bought a case, as previously, for over $1,500.00. Huge disappointment. Half the on-card autos were somewhat smeared and no big hits. This is nothing more than a poor man’s version of National Treasures and is now completely irrelevant. Will no longer buy this overpriced and inferior product. Surprised my 1-Star rating did not materialize with my review! 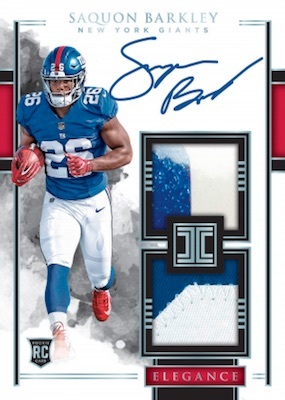 2018 Impeccable Factory Sealed Football Hobby Box Saquon Barkley AUTO RC ?